A chemical peel is a skin-resurfacing treatment in which a chemical solution is applied to skin to peel away the top layers. 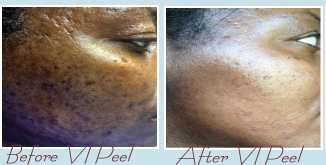 The skin that grows back after a peel is smoother and younger looking. Peels are a safe, effective way to refresh the skin and remove fine lines, age spots, and other imperfections. Chemical peels can be done at different depths — light, medium or deep — depending on the desired results. Each type of chemical peel uses a different chemical solution. Deeper chemical peels produce more dramatic results, but also involve longer recovery times. We offer glycolic peels, SkinMedica’s Illuminize and Vitalize peels, the Vi peel and D'Luxe peels of various strengths. Side effects vary between peels with mild redness, shedding, and a sunburn-like effect resulting in the hours after a superficial peel and scabs and redness resulting from the medium peel. Patients who undergo a superficial peel can typically return to work the next day, while medium peel patients may need a week to recuperate.